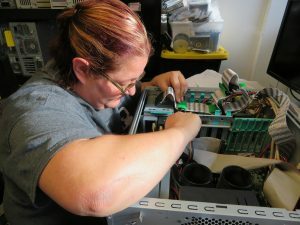 (WACO) – Sarah Elliott proves that the field of biomedical equipment technology is not just for men. “It is kind of priceless to walk on-site and see the surprised looks on some of the technologists’ faces because they have never seen a woman in this business, and the sense of accomplishment you feel when you prove you are just as capable of doing the job as a man,” she said. Elliott, a Texas State Technical College alumna, is a biomedical equipment technician at KEI Medical Imaging Services in Hutto. Elliott graduated in 2017 from TSTC’s Biomedical Equipment Technology program. She said she was glad to think through technical scenarios on similar equipment she would see in the field. Elliott learned about her employer from an acquaintance. On a recent week, her work took her to the Dallas and Houston areas to troubleshoot and calibrate machines. “Walk on-site with confidence, and nobody will ever question your abilities,” she said. Elliott said it is a challenge balancing work and family. She lives in Hutto during the week and travels to Coolidge on weekends to see her family. She is a 2007 graduate of Coolidge High School. “I have always been fascinated with taking things apart and putting them back together to see how things work,” Elliott said. This entry was posted in Waco on November 2, 2018 by Daniel Perry.